Thanks to The Dr. Jane’s HealthyPetNet Foundation, an English Bulldog will enjoy shelter and quality medical care until he can be adopted into a loving, forever family. Our charitable non-profit’s latest financial award has been given to the Southern California Bulldog Rescue which is dedicated to saving the lives of abandoned Bulldogs. Providing safe haven to these noble creatures, this rescue actively works to place Bulldogs in new homes and covers the medical expenses for more than 200 Bulldogs annually. Entirely funded through donations and operated by an all-volunteer network of dedicated Bulldog lovers, SCBR makes sure that every Bulldog that comes their way is cared for responsibly. Officially in the non-sporting group, Bulldogs were once bred to be very aggressive to bait bulls and fight other dogs. Thankfully, this breed has been transformed through many decades of refinement and nurturing, and now most Bulldogs are friendly and eager to please. Despite waning popularity, the English Bulldog is still a common companion in U.S. homes. Unfortunately, many people adopt Bulldogs before learning about the special care many of the breed require. And, heartbreakingly, the irresponsible breeding practices of some enthusiasts have resulted in dire genetic problems in some cases. Which brings us to Spanky, the sole recipient of our foundation’s latest award. If we had to sum up Spanky in a phrase, it would be this … utterly adorable in the face of adversity. Now three years old, Spanky is an exceptionally lovable, brindle-coated Bulldog. Born in a puppy mill, this good-hearted, tugboat of a canine came into the world with malformed legs and hips. His handlers at that time made the decision that would impact the rest of Spanky’s life – they failed to provide the surgery he would need to walk normally. In spite of his misshapen bones, he was adopted out. Sadly, his family gave him up when his condition worsened. Beset by so many problems so early in life, he later started exhibiting signs of Cushing’s Syndrome and a thyroid condition. 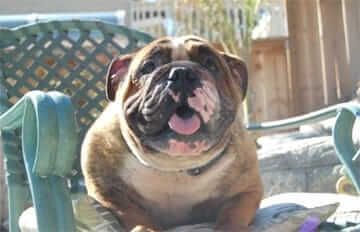 Fortunately for Spanky, the Southern California Bulldog Rescue provided a safe haven shortly after he was abandoned. When Spanky arrived at the rescue, he was malnourished, underweight and losing his hair. He, like so many Bulldogs welcomed by this Orange County sanctuary, needed a great deal of medical care, not to mention regular doses of love and a strict regimen of pets and ear scratches. The costs associated with treating his multiple problems were mounting. Spanky underwent surgery to help correct his hip problem, but the outcome wasn’t as positive as his veterinarian and caretakers had hoped. The vet informed them that Spanky would need a specially-crafted wheelchair. At this point, the money needed to care for Spanky was more than the rescue could spare. Volunteers at the organization sent an urgent request to The Dr. Jane’s HealthyPetNet Foundation. After a meeting of the Foundation Board Members was convened, an award to fund Spanky’s special needs request was granted! Today, we’re extremely pleased to report that thanks to this donation, Spanky has received his specially-ordered wheelchair. Now he’s free to roam the house and scamper after his beloved soccer ball. With his new-found mobility, Spanky is now able to monitor whatever activity is going on in the home. We can tell you he pays especially close attention when there’s activity in the kitchen! For all of you who have purchased Life's Abundance products or made contributions directly to The Dr. Jane’s HealthyPetNet Foundation, we thank you for making possible this generous award to Spanky. You have not only emboldened our efforts to improve the life of this courageous little guy, but hundreds if not thousands of other companion animals cared for by other agencies, too. As Dr. Jane says, “If you can make just one life better, you can improve the world”. If you are interested in supporting the Southern California Bulldog Rescue, or if you live in or near Orange County and wish to learn more about adopting Spanky or any of the other California Bulldogs currently cared for by this gracious agency, you can call them at 714-612-0265. If you wish to support other worthwhile rescues, many of which operate on shoestring budgets, by contributing to our foundation, you may do so online when placing an order online. Or simply send a personal check to The Dr. Jane’s HealthyPetNet Foundation, Inc. at P.O. Box 1425, Palm City, FL 34991. Even if you can only spare a dollar or two, you’ll be providing much needed aid to the organizations attempting to manage the escalating numbers of abandoned companion animals. We know that whoever ultimately claims Spanky as a companion will be touched by his endearing personality. It will truly be a special family that chooses to welcome this gentle spirit into their home and their hearts. We will be keeping tabs on Spanky, and will be sure to let you know of any happy developments! We are so sorry to let you know that our courageous Spanky passed away peacefully in his sleep not too long ago. Even so, we are thankful that the Southern California Bulldog Rescue made his last months comfortable and happy for him. They ensured Spanky’s medical care and located a loving foster family who cared for him like a son. 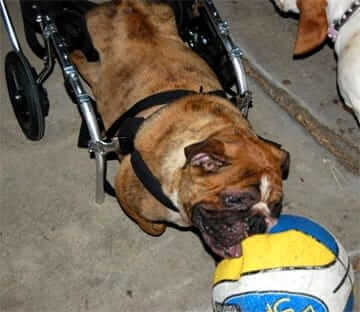 Spanky’s wheelchair has been reclaimed by the rescue group, who will save it for the next special-needs dog. In fact, the Southern California Bulldog Rescue just took in a five-month-old pup named Daisy, saving her from certain death by euthanasia at another shelter, where she was diagnosed with Spina Bifida. Daisy may have to deal with significant mobility problems as she ages and may be a candidate for Spanky’s wheelchair. Just wanted to say thank you for saving a wonderful life and giving him a chance he never had. There really needs to be something done about puppy mills. I am a bulldog owner and HealthyPetNet field Rep. This story made me so proud to be associated with such a wonderful company! It also made me cry knowing that there are others out there who need help! I am so lucky to have such a healthy baby bully! I wanna adopt him, he's so adorable! I will put my money where my heart is and support Sop. Cal Bulldog Rescue. What a great group to help this little guy Spanky and other bulldogs in need. These people are really making the world a better place. I almost had to do the same for my german sh after he had a stoke and those wheel chairs are very expensive, so I am glad that as a customer I can help other dogs in this way. That is so great that Dr Jane helps this foundation. Has Spanky been adopted? I had been following him on petfinder and haven't been able to find him on there for a while. Just want to say thank you for saving an innocent life. It was really noble indeed.